Jackie Baker lived in the warm glow of his mother’s love in Kansas while they both waited for his dad to return from serving in the military during World War II. His hopeful life was shattered when his mother died unexpectedly, and his father returned—not to the celebration that they had planned, but to a funeral. With military precision, his father packed up the house and packed off his Midwestern son to a boys’ boarding school in Maine. The first time Jack saw the ocean, he threw up on the sand. The teachers at the school expected Jack to know all sorts of things eastern boys grew up with, but eventually both boys and masters started to realize that Jack was bluffing his way through the days. After a disastrous incident resulting from Jack’s failure to mention that he’d never been in a boat before, he wandered away from the crowd in shame and found himself drawn to the music that he heard emanating from the custodian’s workroom. This basement room was not occupied by the janitor, but by the strangest boy Jack had ever met, Early Auden. Early was also a boy who had known loss. His parents were gone, and his very famous war-hero brother was dead. The army had sent a letter of condolence, along with his dog tags. Early refused to believe it. He also refused to believe the new theory that their math teacher had introduced: that the number pi did have an end, and that a famous mathematician was going to prove it. Early saw numbers with colors and personalities, and he was bringing order and meaning to his own world by “reading” a story about a character named Pi that he could see in the numbers that he calculated on the board in the workroom. He told the story to Jack, who didn’t know what to believe, but since Early was willing to teach him rowing and even to help him to repair the boat, Jack listened. Besides, the music was good: Louis Armstrong on Mondays, Frank Sinatra on Wednesdays, Glenn Miller on Fridays. When it’s raining, it’s always Billie Holliday. These two young boys were somehow expected to navigate the turbulent years of early adolescence in a time when everyone was losing loved ones in a war and there was no one to care about the emotional needs of two kids who were fed, housed, and taught. After an episode that leaves misunderstandings and guilt all around, Early and Jack set off on a misguided adventure to track down the Great Appalachian Bear and end up retracing the entire story of Pi’s journey, impossibly meeting up with pirates, volcanoes, ancient wise women, and even a whale in an inland river. Dreams and reality twist and weave together to plumb the depths of Early and Jack’s inner worlds, finding significance and revelation from each incredible new coincidence. Early Auden is a wondrous creation. He reminds me of another favorite character, Gary Schmidt’s Lizzy Bright, in their mutual complexity, wisdom gained from painful experience, and sweet, childlike innocence. Early adds the dimension of an autistic savant in a time before such things were diagnosed. All Jack knows is that Early is odd, but in a brilliant way. Vanderpool’s use of metaphor and dreams is so lovingly written that the reader is willing to suspend disbelief and flow with this slowly unfolding story that is surprising, yet completely expected; impossible, yet apt. 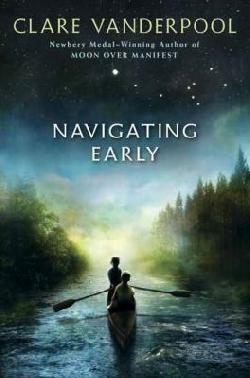 Clare Vanderpool won the Newbery Medal her very first time out with Moon Over Manifest. Navigating Early is her sophomore attempt, born from one of her mother’s dreams and a reading of Daniel Tammet’s book, Born on a Blue Day: Inside the Extraordinary Mind of an Autistic Savant, which I recommend for anyone who wants to learn more about autism. Vanderpool wondered what it would be like to have an unexplainable gift, so she created a character who would help her to find out. Sometimes a writer bursts onto the scene with the novel they’ve had inside them for years, wins fame and accolades, and never achieves that level of creativity again. Clare Vanderpool is not one of those writers. I was even more impressed with Navigating Early than with her earlier novel, and I would be very happy to see yet another medal on this one. Highly recommended for ages 10 and up.